We love playing Santa! It's that time of year and we're off and running with this toy giveaway that is designed to keep your Fido busy with an assortment of adorable holiday toys just perfect for your pup. 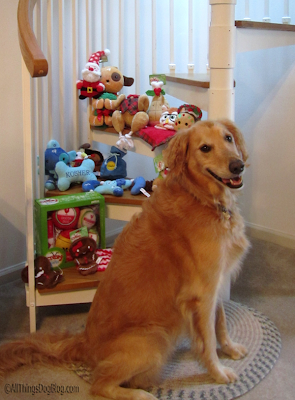 Tanner is posing with an assortment of the holiday toys available at Petco. As you can see, there are Christmas and Hanukkah toys, as well as some that simply relate to Thanksgiving and Winter. There's something for every doggy; our winners will be able to request their preference of Christmas or Hanukkah inspired toys. You've got perks! Friday, November 29. There's another chance for you to snag a holiday toy, and grab a nice assortment of treats to go along with it. Please be sure to RSVP at the link and join us at 12 PM ET for some Twitter fun, following your early morning shopping spree. To enter, you'll use the Rafflecopter that is parked at the bottom of this blog post. You can drive through, entering using those methods you choose. Keep in mind this is all for fun, so please remember to enjoy the journey. Entries will continue through Thursday, December 5 and winners will be announced here on the afternoon of December 6th. To assure prompt delivery, please mark your calendar and check our post or your email for notification by December 7. I'll want to get your shipping information to Petco quickly! I hope to squeeze in an encore of this giveaway--shorter and a tad different. Watch for this announcement coming in early December. Our Jozi is 30 lbs....medium sized long-dog; she's a Corgi! Thanks so much for the opportunity to enter! I have five Treeing Walker Coonhounds - ranging from 52 pounds (my deaf girl) to my two boys (70+ pounds). The other two girls are between those weights. I have 2 pugs, Vinnie is 23lbs, and Rosie is 19. Shiloh is a 20" tall Shetland Sheepdog, and weighs about 40lbs. I usually give him larger toys- both for safety, and he just seems to enjoy them. Nina is a 5 lb Chihuahua. She may be tiny, but she often enjoys bones and toys for the average small breeds. Look at all those great prizes! Maya is a 70lb Labrador and Pierson is a 50lb Australian Shepherd mix. My dog is a 45 pound German Shepherd/Lab Mix! My pup is a 52 pound Doberman mix. Her name is Froggie and she LOVES toys! I have 2 King Charles Caveliers. If I won this would be for my sister's new rescue, Burton, for Christmas. He's pretty large I'm guessing 80-90lbs, a Golden/Aussie/something big- lab or hound maybe? mix. He's 18-24 mths old and an absolute sweetheart. Definitely a large dog but not too much of a chewer, he seems to prefer shoes [though hopefully this phase has now passed!] and smaller bones/ toys. Sissy is a corgi/ cocker spaniel mix and is 23 lbs. Thanks for the great giveaway! My girl, Zelda, is a 25-30 lb Boston Terrier. This is such a nice giveaway for us, because she always knows which presents are hers under the Christmas tree! Thanks for a very useful gveaway! Ted is a Shepard/chow/collie mix and around 98lbs. Daisy is a Amstaff mix and around 60lbs. Thanks for the giveaway! My pups always love new treats and or toys. I have 2 dogs. Toby is a 5 lb. shihtzu and Sushi is a 12 lb pekipoo. They would love small toys. Thank You!! Luma is a 15-20Ib. Lhasa Apso girl :) she says woof and thanks for the fun giveaway! Dexter is a 72-lb Vizsla/Pointer mix! Ruckus the Eskie, Medium size 30lb American Eskimo breed! Daisy and Bambi are Chihuahuas, both 10 lbs or less. and Sami is an Aussie mix around 50 lbs. Coco is a 30 pound American Cocker Spaniel. We have two medium-sized dogs, 34 and 38 pounds. Duke is just under 30 pounds & is a Boston Terrier/Boxer mix. I have four dogs, the smallest is about 15 lbs, one is 20lbs, and the other two are 30 lbs. Our dog, Mercy, is a Chi-Weenie and she weights in at a chubby 12 lbs. My rottie mix weighs 60 lbs. Chihuahua 6, Beagle 18, Corgi 35, Springer Spaniel 57, Dalmatian mix 60. Vlad weighs about 100# & is a Black Russian Terrier. Barkly is a 26# Corgi, but darned if Barkly's not rougher on toys than Vlad is. Vlad's started putting his toys up here on my desk to try to save them from Barkly. I have eight dogs, three of which are rescues. The rescues are a pit bull (68lbs) a long hair chihuahua (8 lbs) and a sheltie (23 lbs). The other five are also shelties, weights from 18-27 lbs. The toys would be for the shelties as unfortunately the chihuahua destroys anything he gets ahold of and the pit bull Has his own basket of toys, mostly balls and super tough chew bones/toys. If we win, these toys would be for the shelties and it's rather cute how they are with their toys. They love stuffed toys and do not want them destroyed. The pit bull doesn't bother their toys, he knows which are his and which are theirs but if the toy killer chihuahua acts like he's going to murder one of their stuffies, they grab it and put it on the bed or somewhere else the chihuahua can't get to. I had to replace a few favorites when I first rescued the chihuahua but now between the shelties, they are always on alert and watching out for their toys and for the most part he gives up and goes and finds a bone he can destroy. Thanks for the chance to win some new stuffed toys for my gang. Melvin is a 42lb Labradoodle! Charleston is a 19 lb spaniel corgi mix! We have 3 dogs that we rescued. 3. Buddy is a lab mix 75 pounds. My dog, Ari, is a Fox Terrier and weighs twelve pounds. Folly is a 17 pound Westie. Blackie is 40 lbs. mixed loves to eat too. Our little guy, Bullitt, weights in at around 9 pounds. He is a mixed breed with a lot of Terrier. Thank you for the super giveaway opportunity. Keep up the terrific blogging. Fellow is a 17 pound 4 month old Beagle/Corgi/Jack Russell mix! Kandy and Kody are spaniel mixes and are 26 & 24 lbs. Diamond is a chihuahua mix and is 9 lbs. Ella is a terrier mix and is 6 lbs. Winnie is a 7-month old Great Pyrenees pup who weighs just under 60 pounds. She gains about 8 lbs each month! Kelly is a 35 lb mystery mutt, and Ike is a 55 lb golden retriever. We have Nala, a Golden Retriever, at about 50 lbs.